Watching the Hummingbird Circus while you savor a good bottle of wine at Kynsi Winery’s patio tasting room sealed the deal for us. Of the six wineries we visited in Edna Valley, this was the winery of the day. The vineyards surrounding Kynsi Winery. 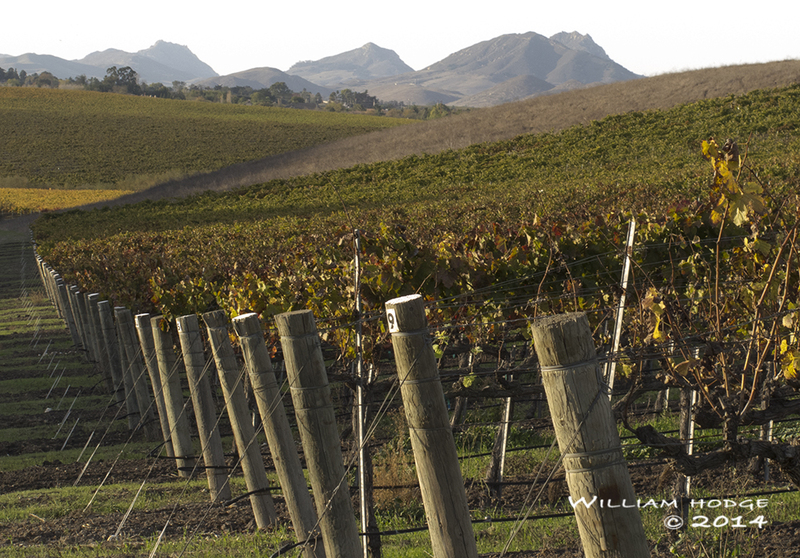 The Valley is a small appellation nestled in the leeward side of Montana de Oro State Park (just west of San Luis Obispo.) There are only 25 or so wineries here with a very distinct taste, farming in black humus and clay-rich soil. While the coast here can be cold and foggy the mountain’s transverse position (perpendicular to the coast) protect the valley while the east-west orientation of the valley lets ocean air cool off the hot growing season. This protects the valley from cold in the winter and spring creating California’s longest growing season. With a longer growing season, they pick grape at the perfect moment without concern of rain or cold conditions forcing an early harvest. Tucked into the southern part of this valley, you’ll find Kynsi Vineyards on Corbett Canyon Road, the western most of the two main north-south roads through the valley. The name Kynsi comes from the Finnish word for ‘talon’ as a tribute to the barn owls who saved the farm from gophers. In the early days the place was infested with gophers. Owners, Don and Gwen Othman discovered a nesting pair can capture and digest up to 40 gophers a night when feeding their young. They installed nest boxes in their barn, and the owls arrived, saving the day. Surrounded by rolling hills covered in grapevine, so far out in the country, away from highways, the estate winery sits in the quiet of the country. You can actually hear your heart beating in the tranquility. Walking away from our vehicle, hearing the heat tick out of the engine, it’s quiet enough to hear the hummingbirds whizzing around. What bottles of wine did we taste? Their tasting room is a small sheltered bar opening out to a grass garden thriving with native California sage. Thusly, the hummingbirds. They’re all over the place. The one particular Hummingbird catching our eye was a little bird with music so loud in her head she didn’t care what anybody else thought. Perched upon a wire fence she danced evenly, bobbing left three times and then right three times. Repeating the dance, left, right, left, right, for several minutes. She was dancing to music we couldn’t hear. Hopefully we will be back soon to see Patrick, Kynsi Winery and the Hummingbird Circus. This entry was posted in Chardonnay, Edna Valley (San Luis Obispo), Pinot, The Pleasures of Tasting Wine and tagged bottle, bottle of wine, california, edna, valley, wine, wine tasting room.